Meet the Family - About Us - L.E. Schwartz & Son, Inc.
As we’ve reached the fifth generation of our family business, this company has reached the hundred year mark in 2010. Even though we are thrilled with the prospect of providing our customers the best of service in the years to come, we feel it wise to look to the past and the words of our founder, Louis Ervin Schwartz as we prepare for the future: "Our company must stand for unquestioned integrity, prompt service and quality workmanship to our clients." His words are a simple yet powerful reminder of who we are and why we have been in business for over a century. They are our credo and remind every employee of L.E. Schwartz & Son, Inc. and our subsidiary, Schwartz Precision Manufacturing, that we earn our livelihood by making sure we continue to provide the highest degree of professionalism job after job for every client we serve. Technology is sure to change dramatically in the years ahead, and we will make sure that all of our employees stay 'up to speed'. Advanced training in every area of our business is imperative for us to remain competitive, yet even though we may become skilled in the latest techniques, we will never forget the most important component of our business. We truly believe that it is the philosophy of L.E. Schwartz, uttered over 100 years ago that has helped our company become one of the largest and most respected firms of its kind in the entire country. Our history is one that is rich in achievement and service. It is our aim to continue our business ethic in the years ahead just as we have for the better part of the last century. Our mission is expressed in our workmanship, professionalism, mutual respect for our clients and each other, and our corporate and individual integrity. By practicing these values we aspire to be a preferred supplier, employer and corporate citizen. We pledge personalized services to achieve maximum value at competitive prices. We pledge our cooperation to ensure that our mutual clients receive the highest quality products and services. We pledge our efforts to maintain long-term relationships through shared goals and values. We pledge support for personal development, empowerment , and partnership in all company endeavors and achievements. We pledge that we will constantly strive to be a valued corporate citizen. The story of Louis Ervin Schwartz could well be called an American Saga. 1910: The immigrant Hungarian metal worker started a company in Macon, Georgia that today is one of the largest and most respected commercial and industrial roofing and sheet metal contractors in the country. 1915: Brother-in-law Adolph Phaul joined the firm and the company name became Schwartz & Phaul. The company prospered during its early years, and when the founder’s son, Harry, joined the firm in 1929,the company expanded its services to include heating, ventilation and air conditioning. 1933: Adoph Phaul died in 1933 and the company name changed to L.E. Schwartz & Son. 1949: Louis Schwartz died and his son, Harry, became President. 1952: Melvin Kruger, the founder's grandson, joined the company after graduating from the University of Georgia Law School. 1953: The company expanded after a devastating tornado ripped through Warner Robins, Georgia, creating a tremendous amount of roofing and sheet metal work during subsequent rebuilding. 1956: The company was incorporated and saw continued growth in commercial and industrial roofing and sheet metal. 1978: Steve Kruger, the founder’s great grandson, joined the company after graduating from the University of Georgia. 1985: L.E. Schwartz & Son opened a new manufacturing facility for its Metal Systems Division. 1987: The company was recognized as the National Roofing Contractor of the Year by RSI Magazine. 1991: A new division called Precision Products began manufacturing precision metal parts and sub-assemblies. 1994: The Precision Products Division became Schwartz Precision Manufacturing, a subsidiary of the corporation, and moved into a second manufacturing facility. That same year L.E. Schwartz & Son, Inc. was named the Georgia Family Business of the Year by Kennesaw State College and the Atlanta Business Chronicle. 1997: Harry Schwartz died after sixty-eight years of service. 1999: Schwartz Precision Manufacturing moved into an 80,000 square foot manufacturing facility to support it’s continued growth. 1999: Schwartz Precision achieves ISO 9001:2000 Certification. 2001: The National Roofing Contractor’s Association presented the company with the Gold Circle Award for workmanship. 2004: Michael Kruger became the 5th generation to join the company after graduating from the University of Georgia. Also in 2004, Schwartz Precision achieved AS9100 certification which is the aerospace model for Quality Assurance. 2007: The Commercial Shingles Division is started as its first large multi-family housing project gets underway. 2009: Schwartz Residential Roof is started after the company decides to give back to the community and its homeowners. 2010: L.E. 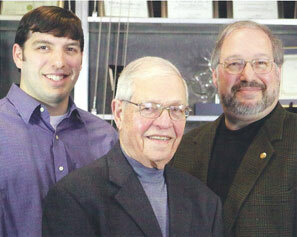 Schwartz & Son celebrates its centennial as the doors have been open for business for 100 years.